Becoming a sponsor of the AMNT provides essential support to busy trustees, presenting a commitment to the pensions industry, whilst gaining company exposure through events, webinars and communications. There are three main sponsorship packages, each one includes a variety of benefits. Some of the benefits on offer can include; event hosting and event advertising, online publicity through our website and social media channels, webinar hosted events, newsletter features and articles plus many many more! We have a great selection of sponsors already on board who bring a wealth of experience and insight into the mix, take a look through our premier sponsors for more details. Benefit from high level exposure for your support. Benefits include a dedicated webpage and active links to your sponsored events, co-hosted regional events and company specific news and white papers. Supporting the AMNTs aims and objectives as a sponsor, you will benefit from industry exposure through public relations and presence amongst members at hosted events, meetings and via website articles and links. Our friends support the association's work by hosting meetings in their environments, whilst gaining exposure through our website listing and submission of key events within our events calendar. If you are interested in becoming a particular sponsor or would like to find out about the many ways you can support the work of the Association of Member Nominated Trustees, please do contact us by email or call for more information. 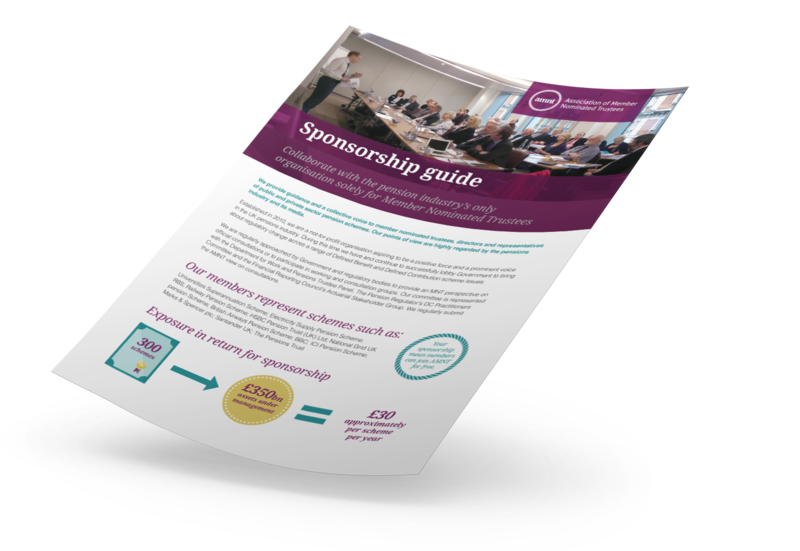 All the benefits and full details about becoming a sponsor can be found in our sponsorship brochure. If you are interested and would like to receive a sponsorship packages price list, you can email your interest by clicking here.